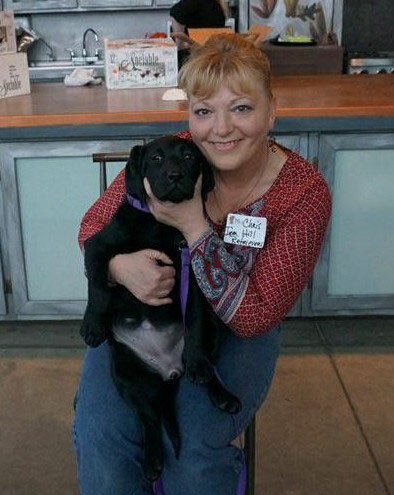 Jill & me at Puppy Jake Fundraiser event. Welcome to Iron Hill Retrievers! Iron Hill Retrievers is located in the beautiful rolling hills of Eastern Iowa, close to Illinois, Minnesota, and Wisconsin. We are a small breeder of English Type Labradors and Golden Retrievers. 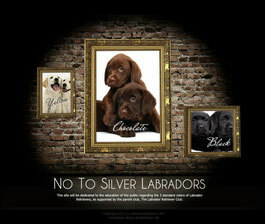 Breeding quality Labs in black, chocolate and yellow, ranging from light cream to fox red. Our puppies are raised in our home with lots of love and care. At Iron Hill Retrievers, both our Labradors and our Goldens typically have a lovely strong head, a wide back skull and thick muzzle, well angulated shoulders and rears. Our Golden Retrievers are from European lines. Most importantly, Iron Hill Retrievers possess true temperaments, very laid-back and gentle in the home, but love the outdoors and the opportunity to hunt if required. All breeding dogs have health clearances before being breed. Our Labs and Goldens have some of the best pedigrees in the Midwest. If you have any questions, feel free to give us a call! Closed on Saturdays & Sundays! 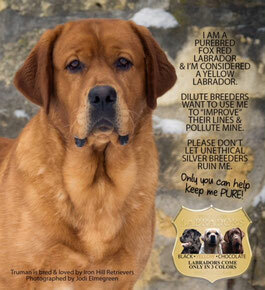 All contents & photographs are property of Iron Hill Retrievers. Unauthorized use is prohibited. All photographs © 2009-2016 Iron Hill Retrievers.